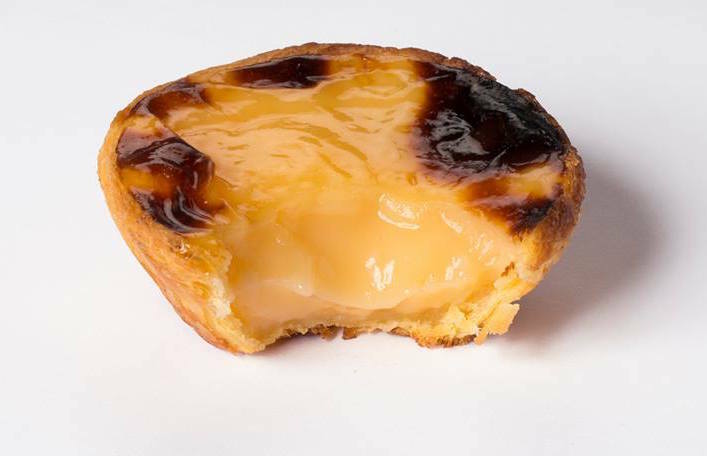 Pastéis de nata - those delicious Portuguese custard tarts - can now be found, freshly baked in the centre of Hammersmith. Made to head chef Lucio's secret recipe, Café de Nata produce a perfectly crisp flaky pastry and creamy smooth custard filling that will brighten your day and ruin your diet. Proprietor Diogo Esteves hopes to make the pastel de nada a popular treat in the UK - just as it is in Portugal and many other parts of the world. They are really delicious and go well with Café de Nata's excellent coffee. So he appears to have a very good chance of doing that. Pastéis de nata were first baked at the Jerónimos Monastery in Belém, Lisbon. But in 1834 the monastery closed. Three years later, after having purchased the monk's recipe, the Antiga Confeitaria de Belém took over. They've been making them ever since. In 2009, The Guardian was so taken with these delicacies, it urged people to visit Belém in an article titled: The 50 best things to eat in the world and where to eat them. 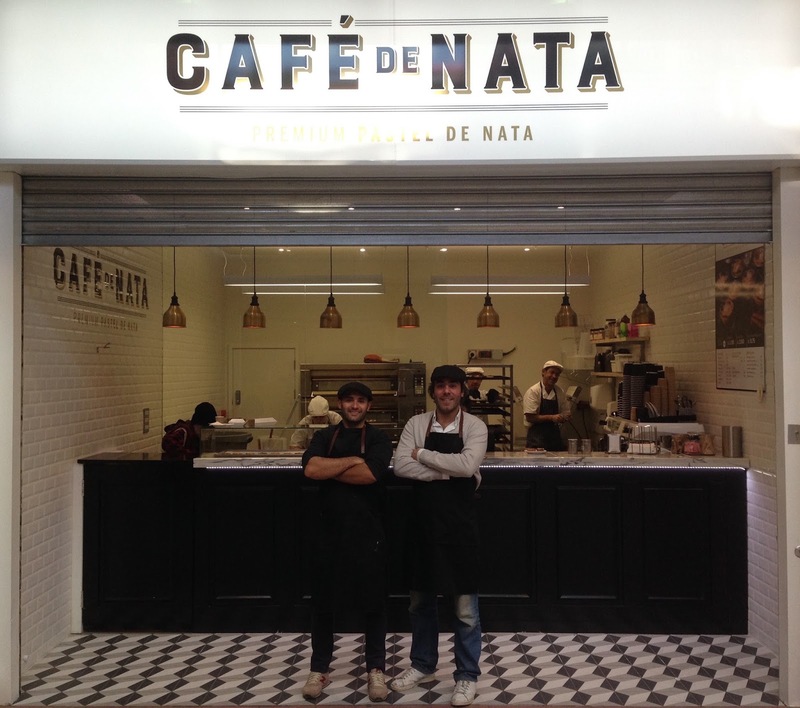 But as the Facebook reviews of Café de Nata say, you can save yourself the journey and enjoy perfectly fresh, warm pastéis de nada straight out of the oven in Hammersmith Broadway. Café de Nata are based in a small shop at 25B, Hammersmith Broadway Shopping Centre that's a part of the bus and tube station. You can view their Facebook page here and follow them on Twitter here. Hammersmith and Fulham is fortunate to have attracted retail entrepreneurs who have brightened the borough's landscape. There's amazing gelato ice creams at Bertotti Pure Italian, stunning French breakfast pastries, cakes chocolates and breads at Patisserie Sainte-Anne, the ever wonderful Brackenbury's Delicatessen and more. I wish Diogo Esteves and his partners good luck with their new enterprise but going by the reception Café de Nata is getting from their customers, I really don't think they'll need it. Sadly, the Belgian and Union Flags flutter together over Hammersmith Town Hall this week, mourning those murdered in the barbaric attacks on Brussels on Tuesday, and sending a message of support to the Belgian people. Thirty one people's lives were taken and 300 more were injured. Such attacks are not a reflection of any religion, they are simply indicative of the poisoned minds of the perpetrators. I know the good wishes of everyone in our borough will go to all those suffering loss because of this terrorist atrocity and to the friends and families, sitting by the hospital beds, of the 63 people still in a serious condition. I am very grateful to Cllr. Max Schmid, the borough’s cabinet member for finance, and his team of finance officers. Max is an accountant who had previously worked at PwC where he worked to help councils and central government be more efficient. I'm glad he's now leading on that for us. We're also keen to see how we can encourage more local services which adds to what the council does and improves life for residents so we're exploring new things like The Casserole Club and looking at how we can better work with the voluntary sector to get things done. 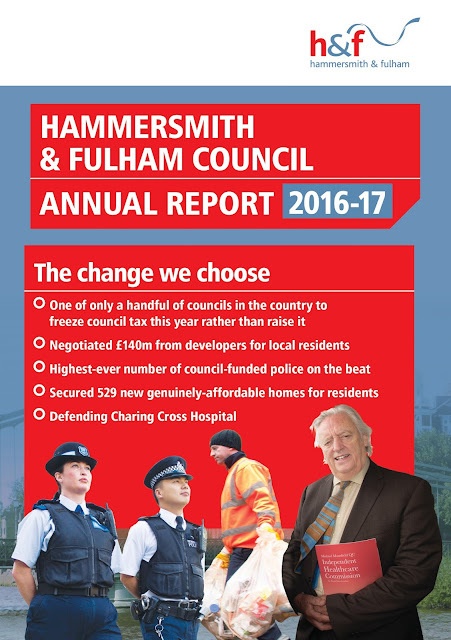 You can read more of about the changes we've chosen in the official H&F Council 2016/17 Annual Report. Cutting the government grant to Hammersmith and Fulham Council by 66% since 2010. Giving councils a number of costly new responsibilities but neglecting to provide any new funds to pay for them. For example, new schemes like Staying Put are good ideas but that programme will alone cost H&F roughly £500,000.00. Basing future government grants to councils on the assumption that all councils will have increased council tax by 3.75% each year over the next 4 years. 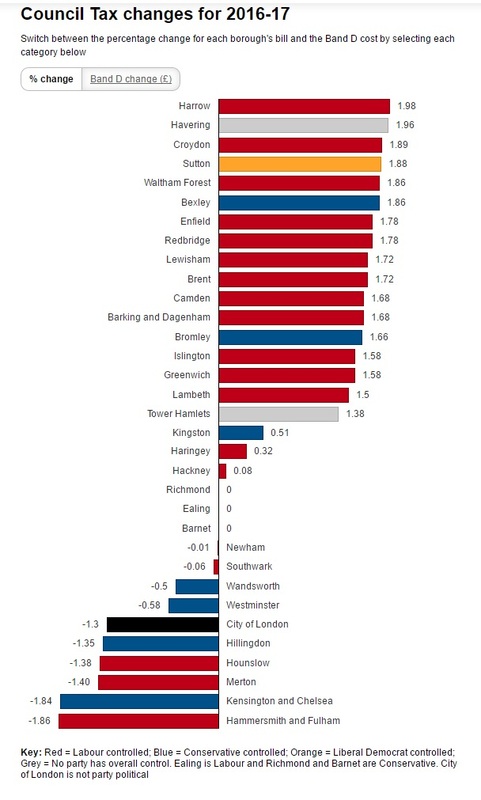 In Hammersmith and Fulham that means the government will subtract £2 million a year from all future annual grants in the expectation we will raise that sum by putting council tax up by 3.75% each year. 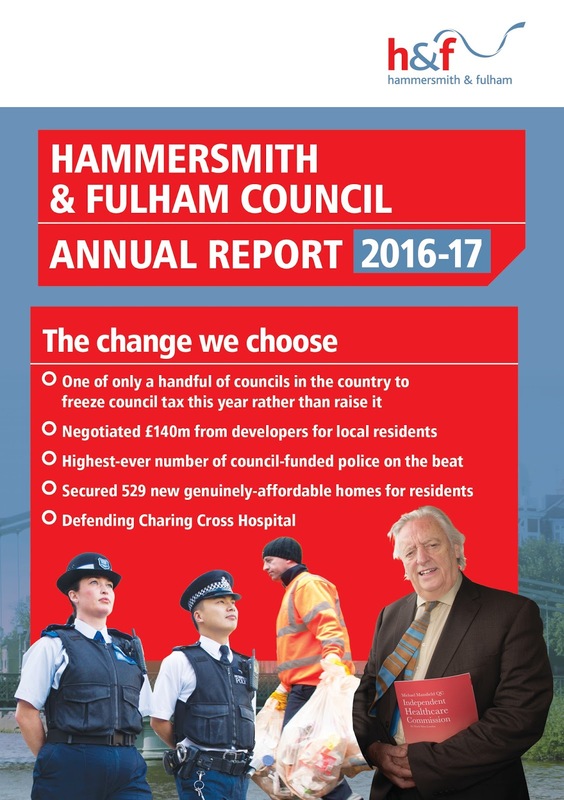 Hammersmith & Fulham's Conservative councillors had little to say about any of this. They haven't been around much since losing the local elections in 2014 but the borough's opposition leader did argue against H&F Labour having reduced meals-on-wheels charges, implying we should continue with their aggressive approach. He also claimed that the government's dramatic cuts to council funding were part of a strategy he supported that would free up councils to do their own thing on finances which is, er... an interesting take on things. H&F's Labour administration will not raise council tax. We will continue to take a tough, cost-cutting approach to wastefulness so we genuinely put more money back into residents' pockets while modernising and improving council services.